A minister on the radio was heard saying that humans beings are all, morally, "condemned criminals" in need of "radical surgery." Holy mixed metaphors, Batman! Not only was that metaphor a language crime, it was theologically criminal, as well! Fortunately for us, he is wrong. In fact, Jesus teaches just the opposite. Jesus, just like the Hebrew prophets before him, consistently taught that we are all free to choose either to do good or to do evil, and that we will be held responsible for those choices when we stand before God. Let us quickly dispense with the idea that we are all condemned criminals. The only ministers who say this too readily discount the idea of our Heavenly Father' vast mercy, or are deliberately hiding this wonderful aspect of our Creator. Of course, what this minister was really trying to imply is that we are all born under an imaginary curse, one that somehow makes us unable to do any good to please God, and that we are therefore born already condemned in the sight of God. This is scripturally false and logically nonsense. That God made us free to choose and liable for our choices is one of the best attested facts of scripture - both the Hebrew scriptures and the words of our Master, Jesus, whom God chose to be our example and teacher in all things. To claim that we are so damaged that we can do no good; that we cannot follow Jesus and do as he calls us to do, are man-made excuses for our failure to obey. Not to mention, it makes Jesus into an unreasonable master, for commanding what cannot be done by us. That would mean that God knows we cannot do it, but had Jesus tell us to do these impossible tasks anyway. If God did this, and of we could not act Righteously, God would be the author of our sins, and an unfair judge. He would be responsible for our actions, and not us, if we were unable by our very nature to obey what He and his chosen son have laid out before us to do. It would also mean that Jesus was a liar, and his teachings calling is to do Good would be a mockery, too. Without our freedom of Will and freedom to act there can be no judgement of our actions by a moral God. But the good news is that we were created with the ability to choose. This ability means that our choices have eternal meaning, and that the Good we do is not just a forced choice made by a domineering God, but instead, is a joyful and grateful response to God's love. The Hebrew Bible is filled with examples of God giving us a free will and the freedom to choose. The story of Adam and Eve is all about our Free Will and ability to choose, and the Jewish people have always understood it that way. Adam's poor choice didn't damage his children's, nor his descendants' ability to choose right from wrong. God is portrayed in Genesis as telling Adam's own son, Cain, that he had the freedom (and the duty) to do right or to do wrong, and to take the consequences of either choice. That, alone, ruins the concept of our alleged "moral inability" to do good, because of Adam's Sin. King David is shown in scripture as sinning and doing evil deeds, but he repented, and God forgave him. He says in the Psalms that he stood after his repentance before God with clean hands and with righteous actions. Isaiah teaches that we are to wash ourselves and make ourselves clean. If we are totally unable to do good, then what could this possibly mean? Therefore, it is abundantly clear that the Hebrew scriptures teach nothing else except that we have the ability to act and to do good, and that we are commanded by God, our Creator, to do exactly that. 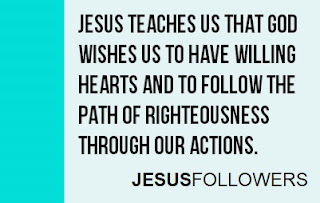 Jesus, also, teaches us that God wishes us to have willing hearts and to follow the path of righteousness through our actions. We are, like King David, fully able to repent of our past mistakes, and to stop doing them, as in the story of the woman caught in adultery demonstrates. Jesus said, "Go, and sin no more." No radical surgery was required of her, simply a determination to repent to do good, instead. Radical action was required of her - and she was able to do it. The kingdom of God is built through our deliberate righteous actions and good works done in accordance with the teachings of our Master, Jesus. So, we see that the minister's foolish statement about "radical surgery" is another theological falsehood. While our wills may have been damaged by our past actions, that can no way mean that we have no ability to turn our lives around by reaching out to God and repenting. Jesus teaches that all may repent, and indeed must repent, of past mistakes, which are a falling short of the high standards God wishes for all of us. And again, all the Hebrew Prophets and Jesus taught that sincere repentance is all that is required of us to begin turning our lives around toward godliness. The Gospel that Jesus preached is a challenge to reach our full potential - how God wishes us to live our lives. The fact that many do not know that the Gospel is a challenge, and are unaware that Jesus' Gospel is fully contained in his words, doesn't make them criminals sentenced to death eternally. Instead, it makes them imperfect, because they are, our of ignorance, not following God's perfect path of righteousness. This ignorance is because wicked ministers have not taught them this Truth. Those who are living imperfect lives don't need radical surgery as much as they need a radical reassessment of their lives. And they should be informed at that there is a better way: to live their lives in accordance with God's will. And those who are living an easy faith without challenge, who believe that good works are impossible (or something that we need not even concern ourselves with) fall grossly short of Jesus' teachings, often warping them beyond all recognition, or worse, ignoring or minimizing them. These ministers, and their flocks, perhaps need a radical new faith, based on the challenging, joyful teachings of our Master, Jesus, who says emphatically that we are capable of doing all that he asks us to do and that we may do all that he has done. THAT is the True Gospel message. It is one worth sharing. Knowing that Jesus pleased God in every way, and said that we may do the same, shows that God and the one He chose as our example have far higher confidence in us human beings then many ministers do. The story of the Prodigal Son (Luke 15:11-24) like many of the parables of Jesus, isn't preached much anymore, and there are some reasons for that. The story, if you've forgotten it, is about a man with two sons, the elder son who was righteous and the younger one who left the path of righteousness, but later returned. The unrighteous son demanded his part of the inheritance, and left his father and brother to live in another city. There, the prodigal son squandered it all in reckless living (prodigal, meaning one who spends recklessly.) Coming to his senses, he returned, humbly, to his father's house, and was welcomed back with open arms by his father, who rejoiced at his return. The parable, of course, is about repentance and returning to our Heavenly Father, who will forgive all who turn back to Him. Jesus was sent by his Father (who is also OUR Father) and we, the younger son, are being called to respond like the Prodigal Son did – with repentance and humility, returning to the Father and begging for forgiveness. God will forgive our sins, but we must first act upon His calling and His offer to receive us again with open arms. Without repentance, there is no forgiveness, nor is there eternal salvation. 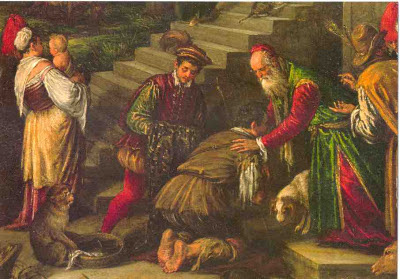 Jesus was sent to call the Prodigals among us back to repentance. We are all called to plead on the Father’s behalf, urging all Prodigal sons (and daughters) to return to righteousness. It is important to understand that Jesus, who was chosen and adopted by God and sent out to be His spokesman and prophet, commanded us to be perfect, as our Heavenly Father is perfect. Jesus calls us to pursue righteousness, to do Good Works in the name of God, Whom we should love with our entire being, and to love and serve our neighbors exactly as we love ourselves. We must take him at his word. He was not “joking” with us or teasing us as if we could never do what he commanded. We are literally being called to not live like the Prodigal Son, recklessly and without the need to do good and righteous Works. This parable Jesus is somewhat unpopular with preachers, and with their flocks, because it does not allow us to ever throw our hands up in despair, claiming we cannot do the Good Works and live the righteous life we are commanded to live. Nor are we allowed to vainly throw rags of praise at God while failing to seek the righteousness His Son calls us to seek. That the older son in the story remained faithful to the father proves that we may indeed obey God in righteousness. It is an easily-missed part of this story that shows that it can be done. Those who are not ill do not require a physician. Jesus tells us that we are morally able to do Good Works, and that those among us who have become ill by living unrighteously need to seek a physician by returning to the Father. There, in the house of the Father, we will be accepted with open arms. The clarity of Jesus' Gospel is obvious to all who read his words. The life, teachings and example of Jesus are a clear window onto the Will of God. We do not need to complicate it or make it mysterious in any way. 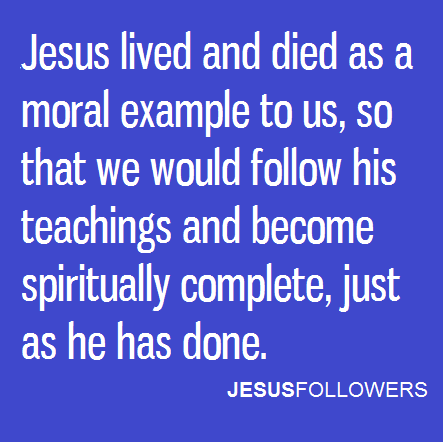 Jesus lived, taught and died as an example, so that we would follow it and achieve spiritual completion, just as he has done. That is the core of his Gospel - his Good and Beneficial Message to all the world, for which he was chosen, anointed by God and sent into the world to preach. 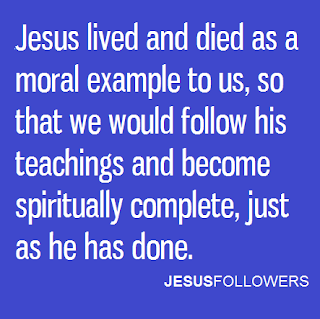 Jesus is the moral example by which we are able to follow in order to reach spiritual completeness. He perfectly models for us how to serve and to love others the way God wants us to love and serve others. 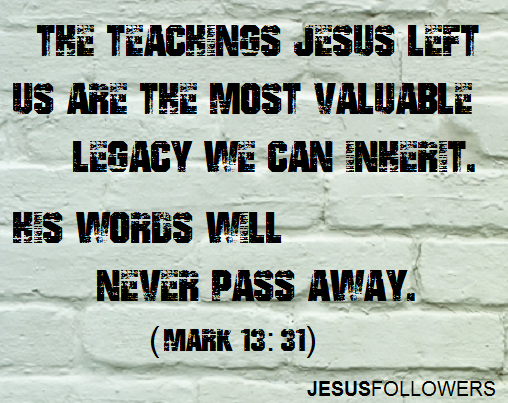 There is nothing greater than the teachings of Jesus. His words and teachings were not his, but they came from God (John 14:10) who Adopted him as his son at his baptism, anointing him with His Spirit, choosing him among all other sons of men to not only teach, but to BE his teachings – our exemplar in all things. 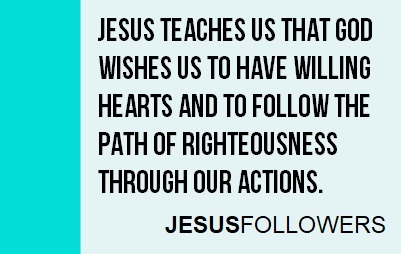 Jesus said his actions always pleased God (John 8:29) making him our perfect example in all things. The wonderful message of the Gospel is this: That WE can do all that God asks of us, because another of our kind, Jesus, was able to fully follow God’s commandments and Will for our lives. But to do as he has done, we must believe that Jesus left us an example that we can really follow. Jesus is for us our Model, our Template, our Guide, our Teacher and our Master. The Hebrew Scriptures and Jesus tell us that God forgives our sins simply upon sincere repentance. Jesus tells us God wishes us to repent of our sins – to be sorry that we committed them, and to cease committing the act of sinning. But without a change in our behavior following this, there is no repentance. Without repentance, we are not following Jesus or serving God. The words, life, teachings and death of our Master, Jesus, challenge us to do, to act, to follow, to serve, to be better, to do more, to try harder, to be humble, yet Righteousness, to serve God not money, to lose ourselves and gain eternity. Jesus clearly calls us to a life of Good Works, done in humility and compassion. Service to others leads us to Spiritual Completeness. Jesus challenges us to become Spiritually Complete by actively seeking and DOING Righteousness, relying on God’s holy Spirit to strengthen us and give us courage to do what is right, and true, and just. Each of us can grow within us a Spiritual Abundance that gives light and hope to the world, and advances God’s Kingdom here and now, in this place. Let us take up the challenge Jesus makes clear for us in his Gospel’s words and teachings! Why was Jesus born? And what was the purpose of his life and ministry? Was he born simply as a bag of flesh, destined only to later die as a ritual sacrifice that would appease an angry god and "cover" our future sins with his remote and perfect goodness, if we simply believed he existed? We find nothing in his words to suggest that scenario, despite the popularity of this misguided belief. A very popular minister once said Jesus did only, "Three days' work." meaning that his death and resurrection were all his ministry was worth. Again, Jesus' own words condemn this false belief. Long ignored by Christian ministers as quaint or out-of-date, Jesus' call to "whatever you wish that others would do to you, do also to them" (Matt. 7:12) summaries his entire ministry and the Hebrew Bible's teaching. We are called to "remain in his love," and we may do this by obeying him and following after his example. The death of Jesus was a continuation of his life – his message of extreme self-sacrifice and love for others, and a voluntary act of devotion to both his "friends" and to God. Who are his friends? Those who do as he commands (John 15:12-14.) Those who would make his death into a magical charm that gives them a "get out of jail free" card so they can continue to sin and forgo Good Works are degrading and spitting on Jesus' cross, not honoring it. And those who are quick to say "Lord, Lord!" but forget it means "Master, Master!" should remember that by claiming Jesus as our Master and God's representative, we must obey his teachings, not just praise his name. The words, life, teachings and death of our Master, Jesus, challenge us to do, to act, to follow, to serve, to be better, to do more, to try harder, to be humble yet Righteous, to serve God not money, to lose ourselves, but gain eternity. This is a faith worth having and a Master worth serving - a faith that bring us life, and life more abundantly (John 10:10.) Those who would throw it away by minimizing and glossing over Jesus' words are throwing God's Kingdom away, and this is one thing all who love God must never do.